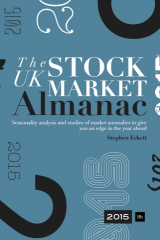 The following charts show the correlation of monthly returns between the FTSE All-Share index and six international indices for the period 2000-2014. 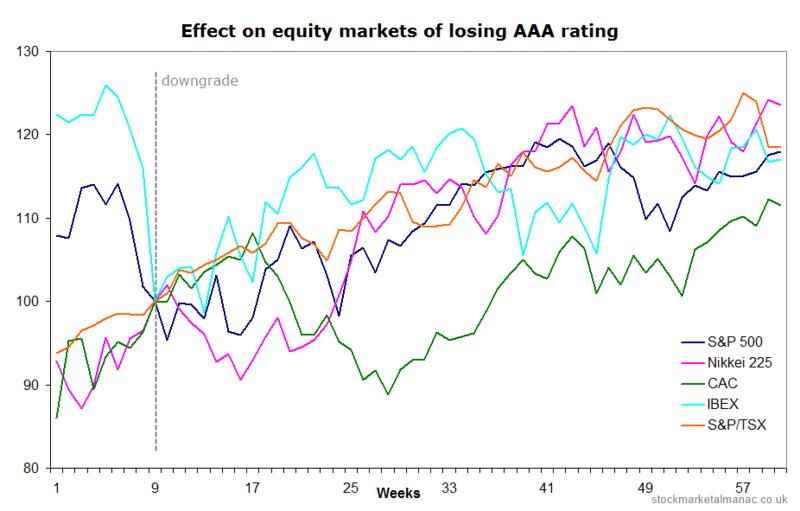 The first observation is that all the markets are positively correlated with the UK market. 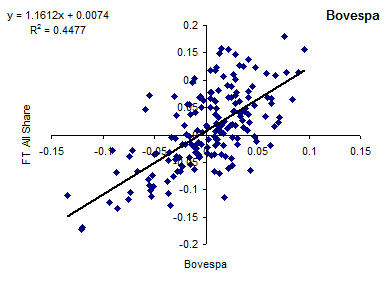 The next question is how closely correlated are they? 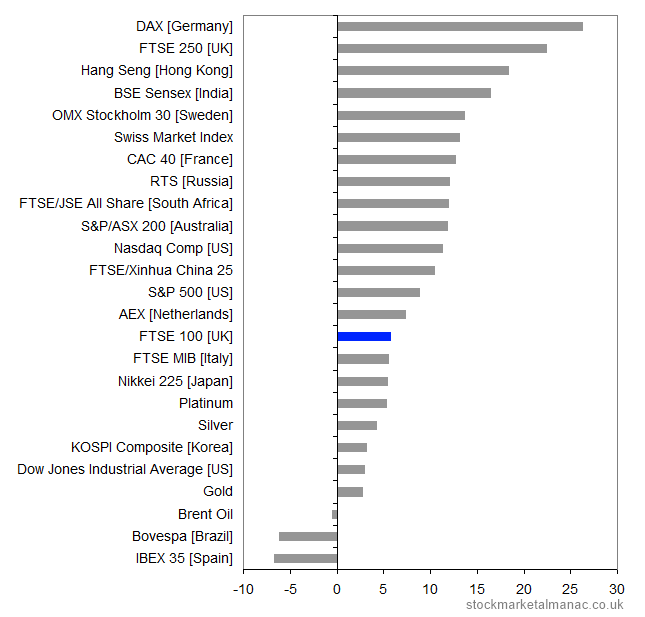 The following table summarises the R2 values for the correlation between the FTSE All-Share Index and the six international indices; the equivalent values are also given for the previous year. 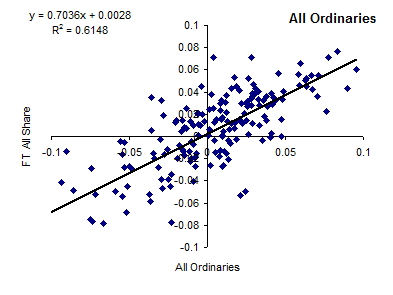 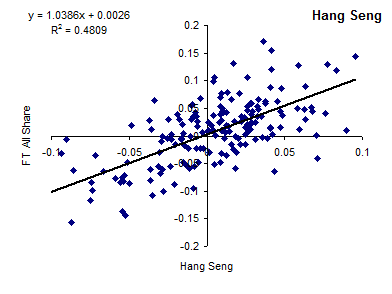 The higher the R2 figure the closer the correlation (R-Squared is a measure of correlation – in effect, how close the points are to the line of best fit). 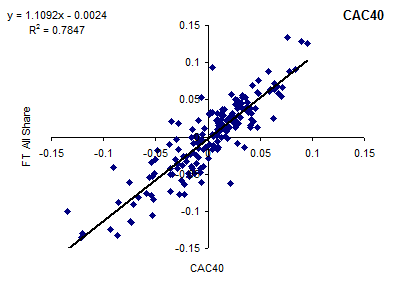 By visual inspection it can be seen that in the charts of CAC40 and DAX the points are more closely distributed around the line of best fit. 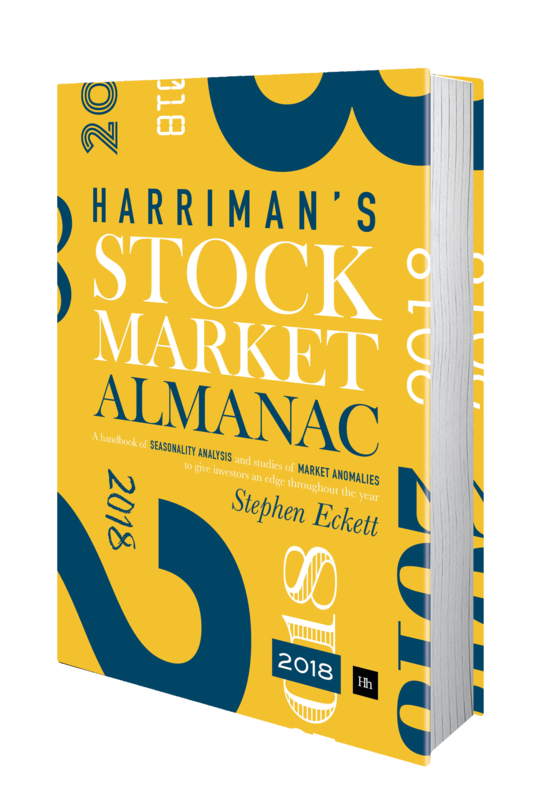 This is confirmed in the table where it can be seen these two markets have the highest R2 values with the FTSE All-Share (the CAC40 value of 0.78 is now higher than that of 0.76 for the S&P 500). 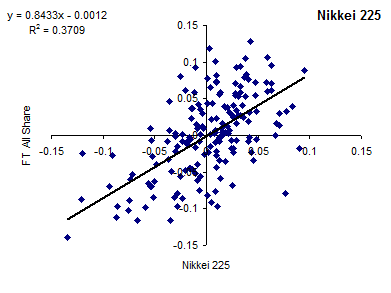 The index with the lowest correlation with the UK market (in the sample) is the Nikkei. 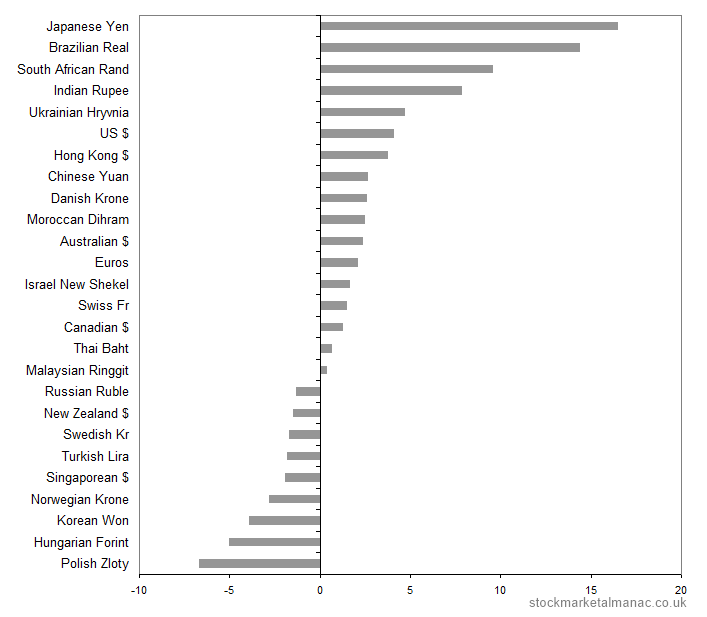 The practical impact of this is that if a UK investor is looking to internationally diversify a portfolio they would do better by investing in markets at the bottom of the table (low R2) than at the top. 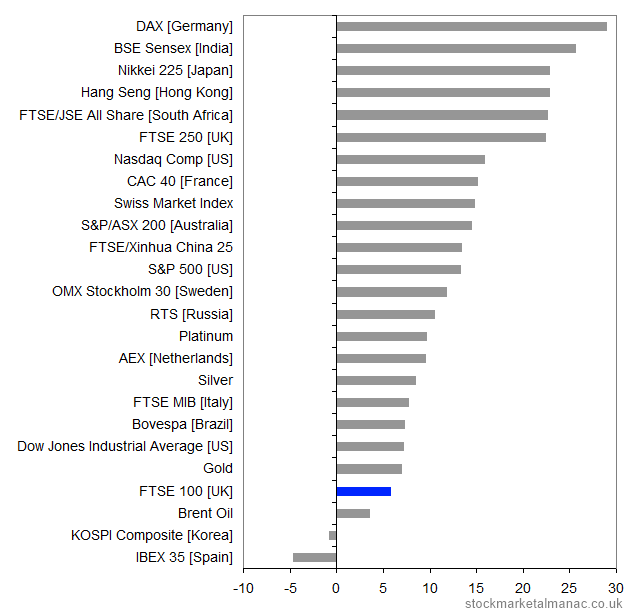 And the good news for investors looking for diversification is that the correlation between the UK market and all the international markets in this study has fallen in the past year. 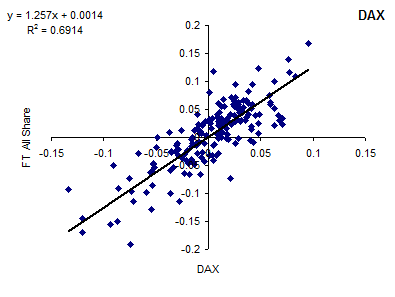 See also correlation between the US and US stock markets.